Home > Membership > Nonprofit World > Do You Have These Four Crucial Committees? Do You Have These Four Crucial Committees? 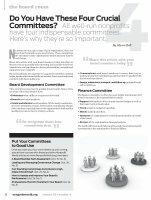 All well-run nonprofits have four indispensable committees. Here's why they're so important.